The Theatre mono power amplifier maximizes all our efforts with more power, more dynamics and greater flexibility. The full-sized chassis allows us to use larger transformers and bigger caps and resistors, delivering greater control and detail. 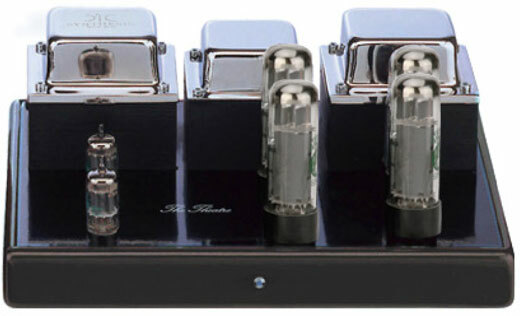 The result is 70 watts of pure pentode output per channel built around a pair of 12AU7 on input/driver tubes and four EL34/6CA7 power tubes in parallel push-pull configuration. We do implement a very modest amount of global negative feedback to make the amp rock solid. We also use a high power, low impedance, solid state rectification circuit followed by a massive pi network using the highest quality caps and custom made choke. In the signal path are only high quality metallised polypropylene coupling capacitors. Rear: Male power sck, fuse protection, On-Off switch, RCA input connector, binding posts.